Good Luck Pork and Sauerkraut | Good. Food. Stories. 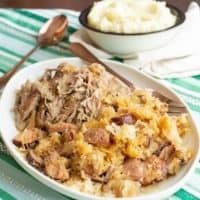 Looking for the pork and sauerkraut recipe you remember from your childhood? It’s right here! Champagne toasts. Caviar and blini. Chinese takeout. All laudable New Year’s rituals. But if you’re smart, you’ll already be stocking up at the meat counter for the most important tradition of all: eating good luck pork and sauerkraut on New Year’s Day. 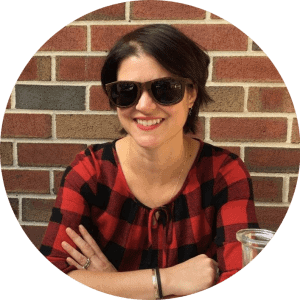 I remember being dragged to Christmas parties as a child, hiding under fold-out buffet tables pushed against wood-paneled walls and laden with steaming Crock Pots. I’d breathe in the briny, slightly acrid perfume of the bubbling kraut and pork fat, watching the grownups’ feet as they shuffled back for another helping. My parents remember their parents feeding it to them every year for luck and likely the great-grandparents were cooking up vats of the stuff when they arrived in the States too. 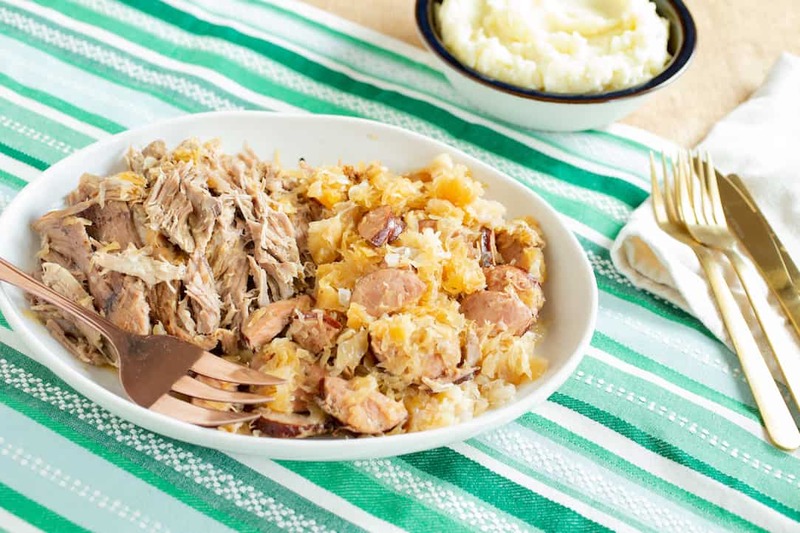 Though I grew up assuming that good luck pork and sauerkraut was just another weird western PA food quirk, it appears that this tradition is something we Pittsburghers can’t claim as our own. The good luck meal is a staple across the great state of Pennsylvania, and in Ohio, West Virginia, or anywhere with a historically prominent Eastern European or German (which is what the Pennsylvania Dutch are, remember? Dutch=Deutsch) immigrant population. The formerly green cabbage of the sauerkraut and the abundant fat of the pig symbolize riches and prosperity for the coming year, the pig doing double duty to stand for progress as a forward-rooting and forward-thinking animal (its four hooves all point toward the front). 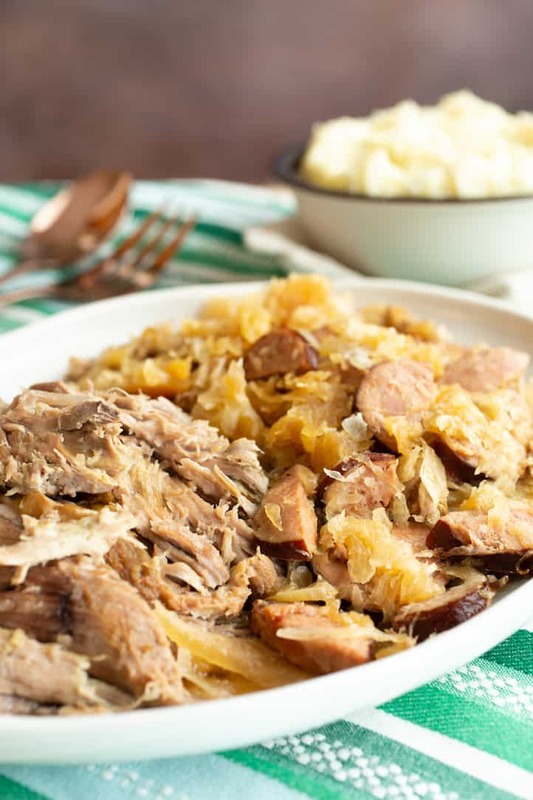 Slavic superstition also dictates that you should eat the long, skinny threads of sauerkraut to give you a long life—smart thinking when you consider the probiotics and other wonderfully healthy byproducts of the fermented cabbage. The type of pork used is more a matter of personal taste and specific family traditions. I’ve seen recipes calling for bone-in pork loin, pork shoulder, and country ribs, and I doubt the good-luck gods are frowning on one and blessing another. My mom, of German descent, always nestles a rolled pork roast into the sauerkraut and whips up a batch of mashed potatoes so she can spoon the meat and kraut on top and mush it all together. My dad, the Italian, prefers kielbasa (or kolbassi, as we pronounce it in the Pittsburgh area). He also remembers many instances of hot dogs simmering in the sauerkraut, though that combo seems more appropriate for summer months at Citi Field. As for me, I split my parents’ preferences right down the middle: kielbasa and sauerkraut atop mashed potatoes. 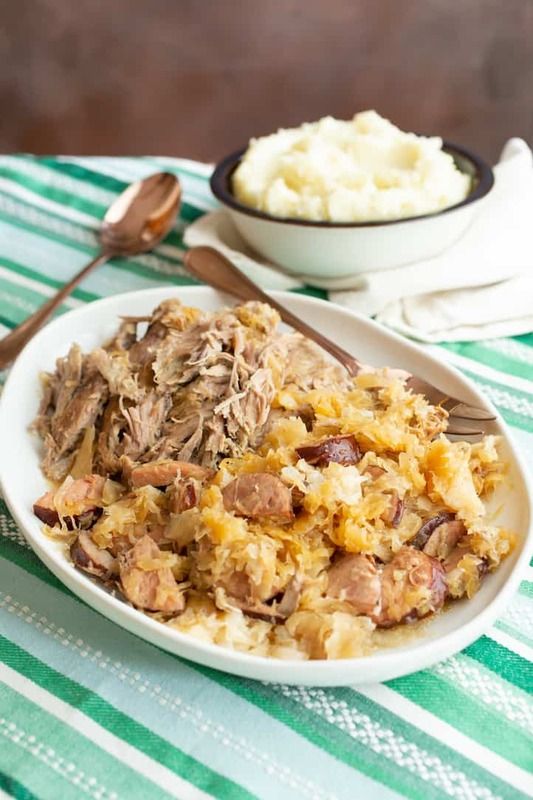 Watch the video and get the recipe below for good luck pork and sauerkraut! Good luck pork and sauerkraut is usually served on New Year's Day. Find out why this German and Eastern European tradition persists (hint: it's delicious!). If using a whole cut of pork such as a roast, heat a tablespoon or two of oil in a Dutch oven or large saute pan over medium-high heat and brown the meat on all sides. If using kielbasa, you can skip this step and instead cut the sausages lengthwise and then crosswise into half-moon shapes about 1 inch thick. In a large Dutch oven or slow cooker, stir the sauerkraut and its brine together with the apple and onion. Nestle the roast and/or stir the kielbasa into the sauerkraut and assess how much liquid is in the pan. You may need to add up to 2 cups water if your kraut is fairly dry. If using a Dutch oven, bring to a boil and then lower to a simmer, cooking low and slow for 3-4 hours. If using a slow cooker, cook on high for 6 hours or low for 8 hours. When the pork is done, it will be fork-tender and falling off the bone or separating from the fat. If using kielbasa, it will have darkened significantly (and require less cooking time). Shred the pork into bite-sized pieces and discard any large chunks of fat.